I can't wait to read at 42 Worcester tomorrow. I've got a number of poems lined up or a story, and I can't decide what to read. How's it been going so far this year? Well, I've had a great start to the year! 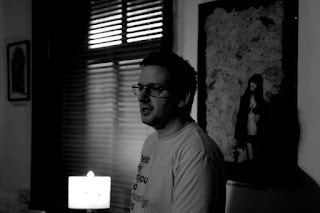 At 42, Drummonds, Worcester, in January 2013, things went really well as I read a dark horror story set in Worcester, and had a wonderful time reading it (photo by Geoff Robinson) to a wonderful crowd. I love 42, and as we approach the two year birthday of 42, things are becoming amazing. There've been a number of venues over the last two years, but we've finally settled into a regular home at Drummonds Bar, and things are going well with ever increasing crowds and an ever-improving line-up. I love reading my poetry and prose here, and I will be doing so again on Wednesday, 27 February, 2013, when the doors open at 7:00pm for another 42. In accordance with another of my goals for 2013, I'm spreading my wings further afield and presenting my work to other spoken word events in the area, and in early February I headed on up to Kidderminster for Mouth and Music, the Valentine edition. It is held in a highly artistic venue (as can be seen above), and it's quite a diverse night, with slots limited to just ten minutes each, and it was great fun performing, with some other great names on the spoken word circuit also performing, such as Holly Magill, Suz Winspear and Gary Longden and Amy Rainbow. 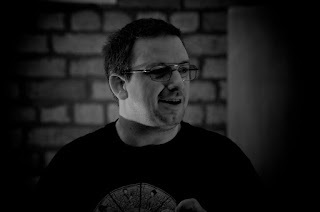 Particularly nice was the write-up by Gary Longden, which said: "Damon Lord started the second half with some short poems I had not heard before which were particularly effective". See you at 42, Drummonds bar, Worcester, at 7pm on Wednesday 27th February 2013!